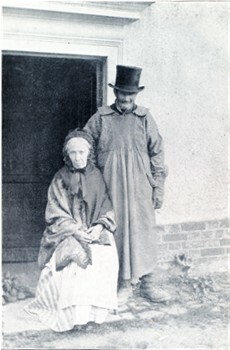 The photograph, taken in about 1895, shows George and Susan Fox of Westmill. He is dressed in a typical farm labourers smock of the period. The following extract, relating to the organists and the organ, give a feel for its approach. 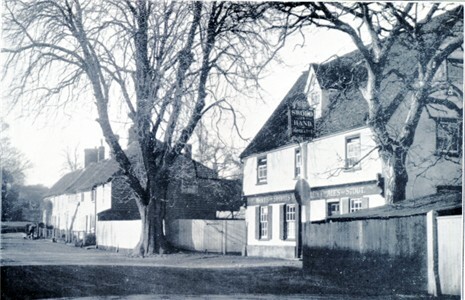 The first organist was a man called Body, who was succeeded in 1832 by James Meredith, the organist referred to above, who used to walk over from his home in Buntingford. He was a stern disciplinarian and kept order among his choir of Sunday scholars with a stick. Tucked away in the deep pocket of his long coat he carried "Bells Weekly News," which he used to read during the sermon, leaving it, for those few in the village who could read, when he walked home iji the evening. It is remembered of him that, before putting a fresh and favourite barrel into the organ, he would say to the children, " Now we're going to have a beauty." He was a relation of some sort to William Prior the parish clerk, who was succeeded as Sexton, but not as Clerk, by " Nickley Barker." The barrel organ was removed, in 1876, to a barn at Vine Farm, where the pipes were melted down by boys for " catty " bullets after it had ceased to yield such disjointed music as they were able to extract from it. Meredith was succeeded in 1856 by Joe Bunce. The salary attached to the office was �paid to James Body in 1830 and continued to Meredith in 1832. 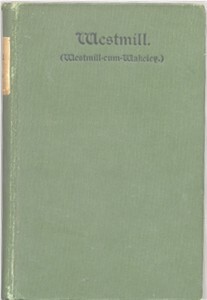 In 1833 Body obtained the post once more, but at the reduced "sallery" of �as the Churchwardens Book (1829-1889) has it. He did not keep his position long, and Meredith returned. Originally standing on a Platform in the Church the Organ was placed in the Gallery in 1842, by "Luppino," who received � 12S. 6d. for moving it.